TMK hired two new employees at the start of the year to strengthen our continuosly growing market. José Fernández and Robert Kurki started working with permanent contracts in early January 2019. José has a strong background and years of experience in export and took the challenge of being responsible for building our new South-American market. Currently José is also responsible for Spain, France, Italy and Portugal in addition to South-America. Robert stepped in to fill the big boots left by Markus Särkkä, who continued on his path towards new challenges. Robert has previously worked with sales in telecommunications and at marketing with hotels- & restaurants in domestic market. As of now, he is responsible for our sales and resellers & importers in Norway, Sweden, Denmark, Estonia, Latvia, Lithuania, Netherlands, Belgium and Canada. TMK’s team is soon to even double its current size due to the ongoing building of our own factory and recruitment for the new employess. Are You interested in working and growing with us? Read more from https://energiakoura.fi/tyoura-tmklla/ and apply now! Celebrating the 1500th TMK 300! TMK keeps growing and today we celebrated the 1500th TMK 300 shear in our factory Multimek. TMK 300 is the product that this company has been built on, so we were very proud to hand over the 1500th shear to our Norweigan Importer Richard W. Naas from Landbruksteknikk AS. Tenho shaking hands with Richard W. Naas from from Landbruksteknikk AS. We also wanted to recognize Ville Pietikäinen from Multimek Oy with “The most improved worker of 2018” award, for his hard work and good communication towards us in the factory! From the left TMK’s President and CEO Tenho Koponen, Ville Pietikäinen from Multimek Oy and Export and Marketing Director Tony Koponen. We had the honor to have the factory workers to celebrate with us. We are building our own factory and headquarters! Today 22.3.2019 we announced our building project to the public in Hankasalmi, Finland. We are starting to build our own production and headquarters. Here is a 3D render of the headquarters. TMK’s business has been growing strongly for the past years and now it’s time to take the next step to provide our customers even better service and higher quality. The growth opportunities are still very strong for TMK and as new markets open up internationally. These new production facilities accompanied with efficient training center, will improve our customer experience through higher quality products, faster response time and more thoroughly trained sales teams across the globe. The building process has now been started with ground work and the factory is to be completed on November 2019. We will be sharing our progress with the project with you frequently, so remember to follow our social media platforms to stay up to date on the situation! Here is a couple of photos from the reveal event. Thank you all for coming to the reveal event! We hope to see you in the factory’s opening party next fall. Very popular attachment, especially on TMK 300, the Delimber has been available for TMK 200 for a while and now finally for TMK 400 as well. Whatever the size of your machine, you can now add the Delimber to your shear package and thus ensure the best possible versatility to your tree clearing job. Our Delimber works without any expensive feeding systems, so it is very simple and mechanically controlled attachment. With Delimber TMK 400 can de-limb up to 400 mm trees. You can even use the Delimber for material handling and for cleaning the fallen brush as you can see from the video below. Pictures of the Delimber on TMK 400. Fall is just around the corner and that means a lot of expos for us. You can find us from expos in Finland, Norway, UK and Latvia. You can find us from stand 830. You can find us from stand L10. You can find us from stand C411. You can find us from stand A-39, A-hall. TMK Bomenknipper is binnenkort te zien bij de Technische Kontakt Dagen. Van 31 mei t/m 2 juni wordt de Nobelhorst in Almere (Nederland) opnieuw omgebouwd tot de grootste demonstratiebeurs van West-Europa voor grondverzet- en sloopmaterieel. We zien u graag tijdens TKD bij stand 3. The 1000th TMK 300 Shear got officially handed over to our Netherlands dealer Mark Roest from Bomenrooierij Roest in our factory Multimek Oy in Multia, Finland. Here is TMK’s CEO Tenho Koponen and Mark Roest shaking hands. We also wanted to recognize Pekka Lamminaho From Multimek Oy with “The most advanced worker in 2017” award, for his hard work in the factory! From the left TMK’s CEO Tenho Koponen, Pekka Lamminaho from Multimek and TMK’s Tony Koponen. Every worker in the factory was invited to celebrate this milestone along with invited quests. After the ceremony we moved outside to see the final demo of the Finlands demo tour, where everyone who was interested got to see our TMK 300 shear in the real world conditions. Big thanks to everyone who came to celebrate with us on! TMK Tree Shear is handing over the #1000 sold TMK 300 shear to our Netherlands importer Bomenrooierij Roest in our factory during the ceremony on 10.1.2018. The event starts at 1pm with the hand over and after that there will be cake and coffee. Cake and coffee is primarily reserved to invited quests but first 30 people to show up can also come and enjoy some cake with us. After the ceremony TMKs demo tour will culminate to Multimek’s nearby forrest at 2am, where everyone is welcome to join us to see how bushes and trees will disappear while you can enjoy some coffee and sausages. There will be possibility to talk with experts on all of our products and see how our shear actually works in real working conditions. TMK wishes everyone Good and Happy New Year 2018. Year 2017 was amazing for us and it is all thanks to you who helped us make it so wonderful. Although last year was so wonderful we still believe that year 2018 will bring something even better. We also opened our online shop that you can find here: https://tmktreeshear.com/shop/ Go and have a look if you can find something for the beginning of this year. We also have worldwide delivery so you guys are in luck! Days fly past when you do something you enjoy! Our export squad is still in the Netherlands at expo, but here in Finland we have already put our focus to the next weeks demonstration days! We will have our full product family basking in the spot lights, and as a visiting star we have from the top of the class Norcar a7545 4T tracked mini loader! We will equip the Norcar with our new TMK 200 Tree Shear and start cutting some trees! The first three TMK Tree Shear buyers will also get a TUIAS ceramics product package! Shears, coffee, sausage and top knowledge of tree shears and mini loaders. That is 22.-23.9 made of! Welcome to visit us at Hyvinkää, Finland! TMK on the road again! At the beginning of September, TMK will take over the Hyvinkää Airport and participate in the Maxpo -expo.We have again the whole range of our product family on display. A week forward and TMK present their products in the Netherlands at Groen Techniek Holland expo. Also our Dealers in Germany and Sweden are showing their products at the same time. Once we got the wheels turning, no need to press the brake! So we continue the week after this, 22.-23.9. with a demo weekend in Hyvinkää. Over there we again have the whole product family from the smallest to the biggest with us! Here are great opportunities to get more info about TMK products, welcome to meet us! Maxpo, At Hyvinkää Airport, FINLAND 7.-9.9. Groen Techniek Holland, Biddinghuizen, NETHERLANDS 12.-14.9. Entreprenad Live, Ring Knutstorp, SWEDEN 14.9-16.9. Demonstration at Hyvinkää, FINLAND 22.-23.9. April expos are done and now we are waiting for Elmia Wood – expo in June! Elmia Wood is one of the biggest forestry expos in the world. 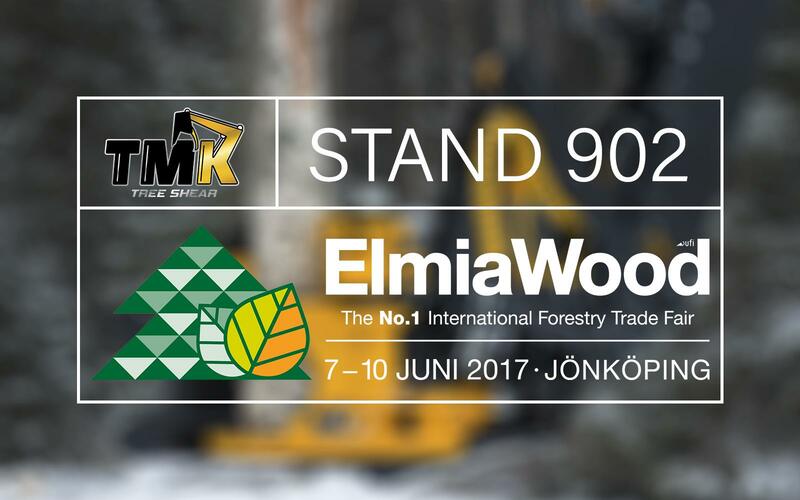 TMK will be attending Elmia Wood with high expectations! You find us in stand 902! Welcome to chat and learn more about TMK!